When debating on where to hold a Batmitzvah or Barmitzvah ceremony in Israel, the obvious locations come to mind – The Jerusalem Archeological Centre, the Western Wall, Massada, or one of the many beautiful synagogues located in Jerusalem. However, there are many more unusual places to consider, which will leave a lasting impression on the family and guests. A ceremony can be held at a Biblical Park, situated between Tel Aviv and Jerusalem. The ceremony and the tour of the Park that would follow would be personalised, and led by an experienced guide, who would offer experiences such as goat herding, olive pressing, and re-enacting stories from the Bible. the party can be held in the same Park, amongst the beautiful trees and bushes, or in a rustic hall if the weather is not suitable for outdoor events. A ceremony can be held in the archeological sites of ancient synagogues, or in one of the fortresses – such as Shuni, which is situated near Zichron Yaakov. 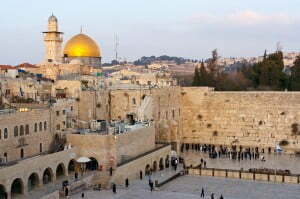 Mount Scopus,overlooking the Old City, is another ideal location, as this is a traditional pilgrim site. This is the area where the Israelites arrived during the three pilgrim festivals of Pesach, Shavuot and Succoth. There are plenty of suitable restaurants or hotels nearby for a celebratory party. Sfat holds many unusual locations – from historic villas to ancient synagogues. There are plenty of restaurants or private caterers who would arrange a party after the ceremony. An event organiser would be able to advise on the most suitable location, taking into consideration the time of year, budgetary restrictions, and the location where the Batmitzah girl or Barmitzah boy would feel most comfortable.